Petsafe Healthy Pet Simply Feed Full Review - Is It Suitable For Your Cat? 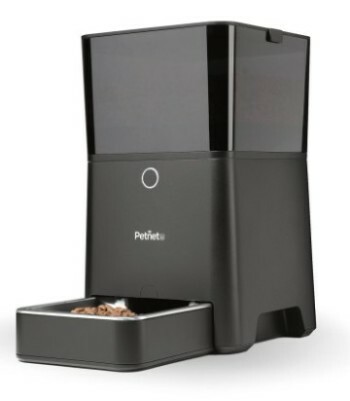 PRODUCT DESCRIPTION (4.4/5) Petsafe Healthy Pet Simply Feed is a fully programmable automatic pet feeder, rated as the best automatic feeder according to customers reviews online. 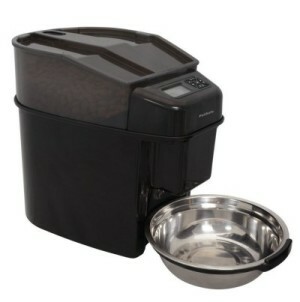 This unit allows you to customize portions and schedule to feed your cat according to its needs. This means you can put your cat on a diet through programming this unit to dispense small amounts of food at a time and several times a day if you want. 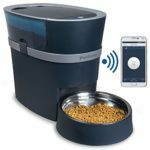 The feeder features a portion-control system that uses a conveyor belt to dispense the kibble which allows dispensing from 1/8-cup (1 Oz) up to 4 cups of food at a time. This special dispensing system allows the feeder to dispense dry and semi-moist food. Additionally, you can program the unit to dispense up to 12 meals by day. The Petsafe Healthy Simply Feed feeder’s transparent hopper capacity is 24 cups of dry food. The unit is made from BPA free plastic and it comes with a stainless steel bowl that is removable and dishwasher safe. This feeder operates on 4 D-cell alkaline batteries (not included). The estimated battery life is up to 1 year. The PetSafe Simply Feed works also with AC adapter (not included). Ability to dispense up to 12 meals by day. Customizable portions from 1/8-cup up to 4 cups of dry food. 24 cups dry food hopper capacity. Programmable portion control allows you to put your pet on a diet. Slow Feed option allows you to dispense a meal over 15 minutes to prevent cats from inhaling the food. Immediate Feed option, allows you to feed your cat the next meal in present time. Pause Feed Option, puts the machine in “standby” from dispensing food, without losing the programming. Locking lid to protect food from pets. Lock on the control panel to protect from unintentional pushes on it. It runs on 4 D alkaline batteries and/or AC adapter, not included. This feeder uses a conveyor belt with divisions made by rigid plastic pieces where each meal sits in. This conveyor moves the food up and releases the allowed meal in the programmed time. The next meal will be always protected by one of the divisions acting as a “guard”, positioned always right in front of the dispensing opening. This protects the paws from trying to access the food. 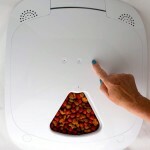 The unit features a locking lid to protect the food from pets and the design is entirely thought to be pet-proof. Petsafe Healthy Pet Simply Feed comes with a stainless steel bowl that goes attached to the feeder with a plastic hoop that holds the bowl right under the feeder’s chute. This allows the bowl be easily removed at any time for cleaning. Note About The Feeder’s Power Source: This unit runs on 4 D-cell alkaline batteries (not included). Also, there is an optional PetSafe power adapter you can purchase at the bottom of this review. 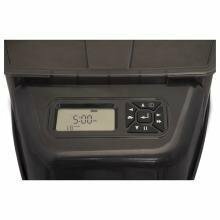 By using batteries and AC adapter you back up the feeder in case of power outage, maintaining the settings so the feeder will keep working no matter what. The Petsafe Healthy Pet Simply Feed features multiple feeding modes, allowing you to adapt feedings according to your pet’s needs or your schedule. Slow Feed Mode: This option prevents cats from doing the “vacuum cleaner” effect with the food. The cat gets his meal in a range of 15 minutes, dispensing a little at a time, to complete the whole meal within this time. This programming option helps enormously if your cat is used to inhaling its food and then vomits. Immediate Feed: You can forward the next meal to a present time if you need with this option. Pause Feed: Useful option if you are planning to be out o town for a weekend and your are taking the cat with you. You can pause the operation of this feeder without changing or deleting the programming. WHAT ARE THE PROS AND CONS OF PETSAFE HEALTHY PET SIMPLY FEED? Sturdy and solid constructed unit. Fully customizable in portions (e.g. big breakfast, small dinner). You can customize the feeding schedule to any time you need, up to 12 meals a day (not preset intervals between each meal). Ability to dispense meals in a range of 15 minutes to avoid speed eating. Special design keeps those mischievous paws from trying to reach the food. Stainless steel bowl prevents feline acne. Bowl is removable for easy cleaning. This also allows you to use a different bowl if needed. Control Panel can be locked for accidental hits. Transparent hopper allows you to see the food level. Ability to stop the feeder from working without losing the programming. You can forward the next meal if your cat is hungry. The unit can be powered with AC adapter and batteries as backup, so in case of power outage the feeder won’t lose the programming and will keep working no matter what. A little loud when food hits the bowl. The included bowl is too deep for an average cat. They need to lean down too much to eat, since the bowl does not get filled to the top. The chute is too close to the bowl, leaving the cat eating more to the side of the bowl. No a problem if you raise the feeder a little or if your cat is short. Not good if your cat uses metallic tags. When you first turn on the feeder, make sure to put food on the top of the conveyor belt so the unit starts dispensing. If your cat does not like the chute too close to the bowl, you can raise the feeder, placing it on a higher surface. Another option is placing a more shallow bowl. The feeder’s chute is fairly close to the bowl, leaving a kind of narrow space for the cat’s head and body. If your cat does not like the chute being close to the bowl, there is an easy solution of placing the feeder on a higher level and then this unit will work well for your cat. Some cats don’t mind eating close to the chute and kind of from the side of the bowl, they adapt better to things. 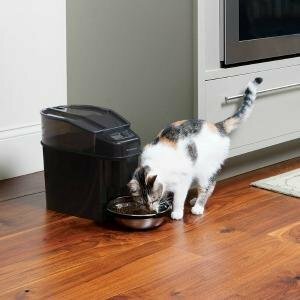 The feeder offers you the option to customize portions, time and length of time to dispense one single meal and that’s an advantage over other feeders, especially if you have a cat that eats too fast. Small to medium sized cats. Cats that need to eat small meals several times a day. Cats that inhale the food when eating. If you need a fully customizable feeder in schedule and portions. If your cat is tall. If you don’t want your cat to lean down too much when eating. If your cat does not like being touched by anything when eating. For cats with metal tags that might hit the bowl while eating. If you need to place the feeder next to your bedroom and the feeder runs at night or very early. How many kg or litres of dry food does this feeder hold please? I cant see it mentioned on any of the reviews I have seen so far? Hi Tanya, the capacity has been stated on this review as well. It’s 24 cups dry food. How does this work with ants and can the food go stale? It depends on the food. If is a natural dry food with no preservatives it may go stale. If it’s regular dry food and in warm weather I recommend not to fully fill the hopper, only up to 50 or 70%. In nice cool weather you can totally fill the hopper and the food won’t go stale. Regarding ants, this feeder has a locking lid, however, there is a open spout from which the food will drop as programmed. While there is a hard plastic flap that keeps the cat’s paws from getting food between meals through this spout, it is possible that ants could find a way in. This feeder is intended for indoor use only. As a tip you can put Bay leafs around and that keeps the ants away. I’m going on a cruise in June. How many days can this be set up for? The cat gets two feedings a day. It’s a third of a cup per feeding. It’s dry science diet food. I’m having a friend check up on her a couple of times. Thank you. Hello mary, once you program the unit it will repeat this feeding schedule every day so as long as the feeder has enough food, the feeder will be able to feed your cat. However, it’s recommended not leaving your cat alone for too many days. How many days are you going to be out in this cruise?. Also, make sure to put batteries in the feeder as power backup in case of power outage. Hope that helps!